Wilton, arguably the world's premier manufacturer of cake decorating supplies and equipment, publishes a number of specialty Wilton cake decorating books for bakers and decorators of all ability levels. Whether you are just beginning and have never decorated a cake before or you've been decorating for years and have completed many professional-level cakes, Wilton has tips and instructions that you can use to improve your work. Before you choose the book that's best for you, it's helpful to get acquainted with the different titles that Wilton publishes and the information that each book contains. 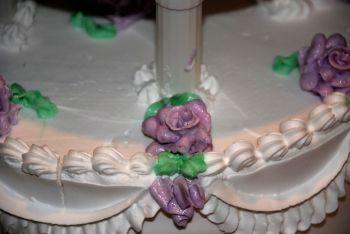 How to pipe with different-numbered frosting tips to create different decoration effects. This beginner's guide also includes a recipe for buttercream frosting, advice on baking and leveling cakes, and instructions for making simple flowers out of frosting. 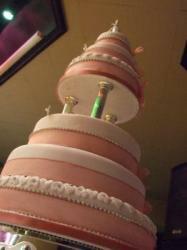 Wilton also publishes books designed for wedding cake bakers and decorators. Wedding Style goes beyond cakes and organizes by color to present brides with choices and ideas for invitations, decoration themes, guest favors, and more. The book plays a similar role to a wedding planner and guides brides as they plan their wedding days with a specific color scheme. Returning to their specialty of cakes, Wilton's Wedding Cakes: A Romantic Portfolio lays out tips, techniques, and instructions for 38 wedding cakes. Directed at brides as well as decorators, the book also contains a pull-out wedding-planning supplement. Some Wilton books can teach you how to decorate tiered cakes. Though not specifically presented as a wedding-cake book, Wilton Tiered Cakes can give brides and wedding-cake decorators a lot of inspiration. Most wedding cakes are elegant, tiered, and designed for a crowd, and the cakes in this book fit all of those requirements. Wilton's Decorating Cakes attempts to assemble and organize the knowledge that the pro cake decorators at Wilton have gathered over the years. It includes many basic and advanced piping techniques, complete cake designs, recipes, and a fair amount of information about baking cakes. Use of Decorating Tips is a short, quick reference guide for decorators. It covers basic information about how to use different frosting tips to pipe patterns and a wide variety of designs. Celebrate! With Fondant is Wilton's book for decorating cakes with fondant. It includes more than 40 complete cake designs for many occasions and also shows readers techniques that can help them complete novelty cakes or sculpture cakes. Jo-Ann Fabric: Jo-Ann sells a variety of Wilton books both on their Web site and in their stores. Amazon: Amazon sells nearly every Wilton book available as well as many other Wilton products, caddies, and equipment.